VietNamNet Bridge - A 30-square meter room misty with steam in the middle of Hanoi is the site where a famous scientist discovered a way of cultivating cordyceps militaris. Pham Van Nha, director of the Center for Biological Struggle under the Institute of Plant Protection, said the room on the fourth floor of the Institute of Plant Protection is always kept at 22oC and the humidity is set at 84 percent thanks to a steam injection machine. It is called the ‘Tibet room’ because thousands of experiments are carried out to replicate cordyceps mushrooms sourced from Tibet. In 2006, during a working visit to the US, Nha visited the Cancer Prevention Center, where he saw US scientists study the use of medicinal features of cordyceps mushroom in cancer treatment. Nha, who is an expert on pathogenic fungi and bacteria in plant protection, showed his interest in the study. The dream of producing cordyceps militaris in Vietnam arose and Nha decided to spend $1,000 to buy seed mushrooms for replicating purposes and brought them to Vietnam. Cordyceps mushrooms in the wild are very scarce. The mushrooms grow on areas of a height of 3,200 meters and higher like the Himalayas. Cordyceps mushrooms in the wild are very scarce. The mushrooms grow on areas of a height of 3,200 meters and higher like the Himalayas. They are found in high mountains in India and Nepal. Only 80 kilos of cordyceps mushrooms are collected a year, which explains why the mushroom is so expensive. The US cancer prevention center only sells seeds, not replication technology. With the breeding mushroom, Nha returned to Vietnam and, together with his coworkers, worked on the production process. 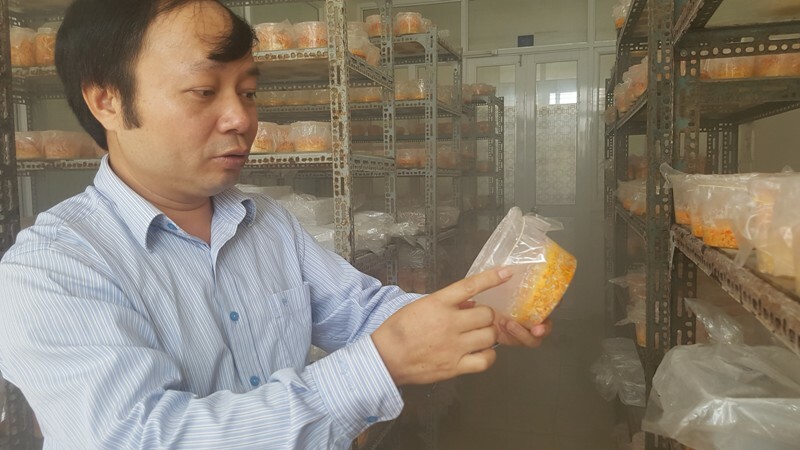 Since 2006, thousands of experiments were carried out until 2011, when Nha and his team found the process of producing cordyceps mushroom on hosts (silkworm) and industrial cultivation. The scientists grind silkworms and mix the ground silkworm with water. After that, the mixture is poured into a vase with some brown rice and put to sterilized steaming at the temperature of over 120oC for 30 minutes. The next step is growing the seed mushroom into jars and brought into a cultivation room. The room is set to have the temperature, humidity and other conditions similar to the natural conditions in Tibet, where the precious mushroom grows. According to Nha, cordyceps products are sold at VND1 billion per kilo in the market. Meanwhile, the Institute of Plant Protection’s products cultivated on hosts are sold at VND100-120 million only, and the products cultivated in artificial environment at VND7 million. Though the production cost is just equal to 1/10 of the price of cordyceps from Tibet, the quality is not inferior to the expensive product. According to Prof Academic Dai Duy Ban, cordyceps help boost the body's immune system, protect kidneys, improve cardiovascular health and recover health.